Twenty large sailing ships loaded grain in the Gulf in 1933. Most of these sailing ships were from the Finnish Ship owner Gustaf Erikson’s fleet but the last of the German Laeisz fleet, Padua & Priwall, Vinnen’s Magdalene Vinnen also loaded along with Favell, Finland, Abraham Rydberg and CB Pedersen from Sweden. From December to March these sailing ships would sail in from the Great Australian Bight after travelling from their home ports in Europe, usually calling at Port Lincoln on the western shore for their orders. Some would remain in Port Lincoln to load and others were sent off to other ports in the gulf – Port Broughton, Port Germein, Port Augusta, Port Pirie, Port Rickaby, Wallaroo and Port Victoria. As there was an open roadstead, tugs were not required. They all had long jetties, the one at Port Germein being a mile long. At Port Victoria the water was not deep enough for large sailing ships to go alongside so the bagged grain was taken out to the sailing ship anchored offshore in ketches. These were small sailing craft that carried produce and other cargoes around the Gulf in the years before road transport resulted in their demise. 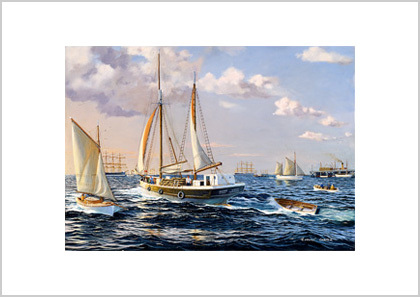 They were not all ketch rigged; some two- and three-masted schooners were used but still referred to as ‘ketches’. 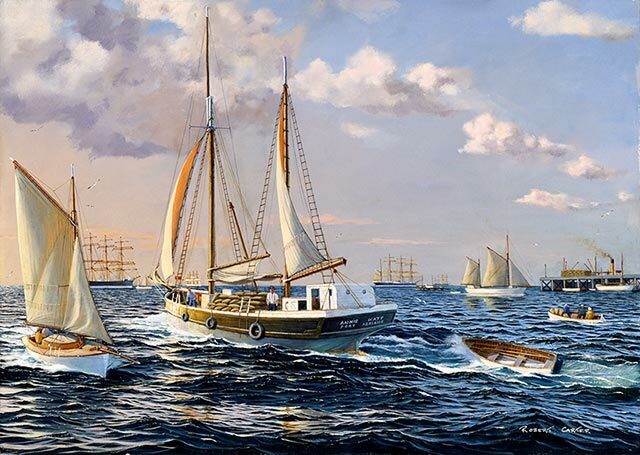 In earlier years they sailed out to the waiting sailers at anchor but all had auxiliary engines in the latter years. The ketch portrayed here is Annie Watt, which has been restored. It was customary to tow the dinghy astern as bagged grain was also loaded on top of the hatch where the boat was normally kept. The last sailing ships to load at Port Victoria were the four-masted barques Pamir and Passat in 1949.